IMGT/DomainSuperimpose is part of IMGT®, the international ImMunoGeneTics information system®, the high-quality integrated information system specialized in immunoglobulins (IG), T cell receptors (TR), major histocompatibility complex (MH) of human and other vertebrates species, immunoglobulin superfamily (IgSF), MH superfamily (MhSF) and related proteins of the immune system (RPI), created in 1989 by Marie-Paule Lefranc (Laboratoire d'ImmunoGénétique Moléculaire, LIGM, Université de Montpellier and CNRS) and on the Web since July 1995. 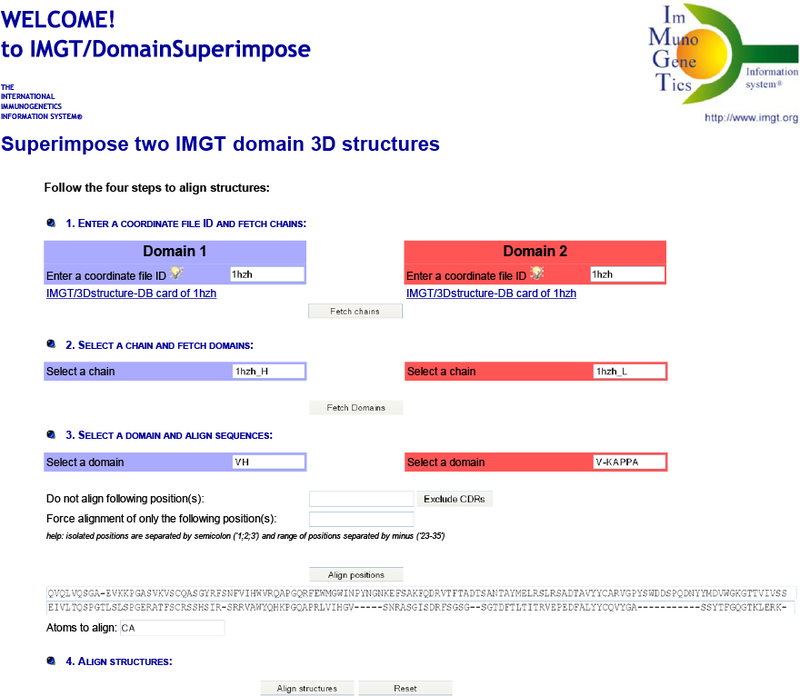 IMGT/DomainSuperimpose superimposes domains of IG, TR, MH and RPI chains with 3D structures in IMGT/3Dstructure-DB, using the method of the least squares fit for the structural comparison. Structural data are extracted from IMGT/3Dstructure-DB. The tool provides a custom made structural alignment based on the IMGT unique numbering, calculates the root-mean-square deviation (RMSD) for the two structures to be superimposed and displays the two superimposed domains. Domain sequences are numbered according to the IMGT unique numbering for V-DOMAIN and V-LIKE-DOMAIN , to the IMGT unique numbering for C-DOMAIN and C-LIKE-DOMAIN , and/or to the IMGT unique numbering for G-DOMAIN and G-LIKE-DOMAIN. Fitting is performed using the McLachlan algorithm  as implemented in the program ProFit (Martin, A.C.R., ProFit). to superimpose two IMGT domain 3D structures from IMGT/3Dstructure-DB and to calculate the superimposition RMSD by CA pairs. Domains can belong to the V, C or G IMGT domain types. The V domain comprises V-DOMAIN of IG and TR and V-LIKE-DOMAIN of proteins other than IG and TR , the C domain comprises C-DOMAIN of IG and TR and C-LIKE-DOMAIN of proteins other than IG and TR  and the G domain comprises G-DOMAIN of MH and G-LIKE-DOMAIN of proteins other than MH . to create a structural alignment based on the IMGT unique numbering. Using the default parameters, IMGT/DomainSuperimpose performs a fit on CA atoms, after automatically identifying which residues should be paired. Pairing uses the IMGT unique numbering, allowing structures to be superimposed according to the IMGT Collier de Perles delimitations. The IMGT/DomainSuperimpose tool generates the structural alignment and uses the ProFit program to perform the least squares fit of the two selected protein structures. to improve the structural fit using optional parameters, by excluding IMGT-CDR in the structural alignment, by forcing some selected position(s), or by modifying manually the paired residues in the alignment boxes. to superimpose two IMGT domain 3D structures belonging to different IMGT domain types for example to compare a V domain with the C domain. For Domain 1 and Domain 2, enter the coordinate ID (IMGT-PDB coordinate file ID) and then click on 'Fetch chains'. Then select a chain for both IMGT-PDB ID and then click on 'Fetch domains'. Select a domain, align sequences and click on 'Align sequences' to perform the sequence alignment. Any atoms of the backbone may be specified for both fitting and RMSD calculation (e.g. atoms: N,CA,C,O). Click on 'Align structures' to perform the fitting. 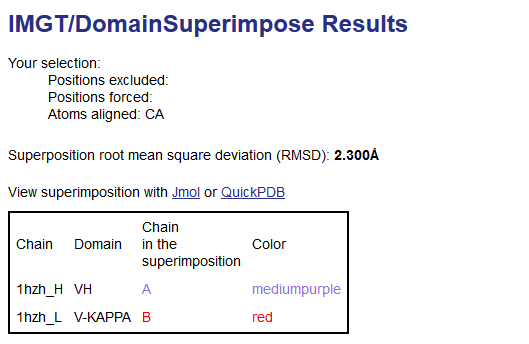 Results show the superposition root mean square deviation (RMSD) in angstrom (Å) and the fitted coordinates for the two domains with chain and color used in the superimposition by Jmol or QuickPDB. by modifying manually the paired residues in the sequence alignment before aligning the structures. The RMSD is calculated by CA pairs over the fitted V-DOMAIN. The superimposed 3D structures can then be visualized in the Jmol or QuickPDB browser.